Six days after being shut out in Schneider Arena, the #12/11 Terriers (3-4-1) again face Providence College (5-2-0), this time at Agganis Arena. Game time tonight is 7:30 p.m. In last week’s meeting, the Friars scored all three goals in the second period, while goalie Hayden Hawkey, who earned Hockey East Defensive Player of the Week honors, stopped all 22 BU shots. The Providence offense is led by Josh Wilkens (6 points), Kasper Björkqvist (5) and Jacob Bryson (5). Bobo Carpenter (9), Patrick Harper (8) and Jordan Greenway (6) are the top BU point-scorers. ►This Week’s Episode of Inside BU Hockey features Bernie Corbett’s interviews with Head Coach David Quinn, freshman forward Shane Bowers and Northeastern head coach Jim Madigan. Three 2017 recruits—forward Trevor Zegras and defensemen Case McCarthy and Alex Vlassic—will play in the World U17 Challenge in British Columbia along with their NTDP U17 teammates. Team USA's first game is Sunday against the Czech Republic. Johnny McDermott, who went to the USHL following an injury-plagued freshman year at BU, will not return to Commonwealth Ave. next season, opting to continue his career at Providence College. 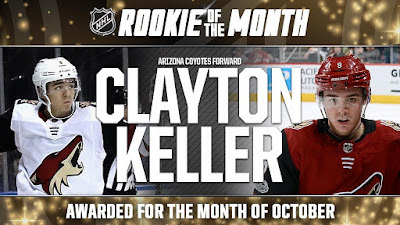 Last year’s NCAA Rookie of the Year, Clayton Keller, has been named the NHL’s Rookie of the Month for October following his nine-goal, six assist performance for Arizona. 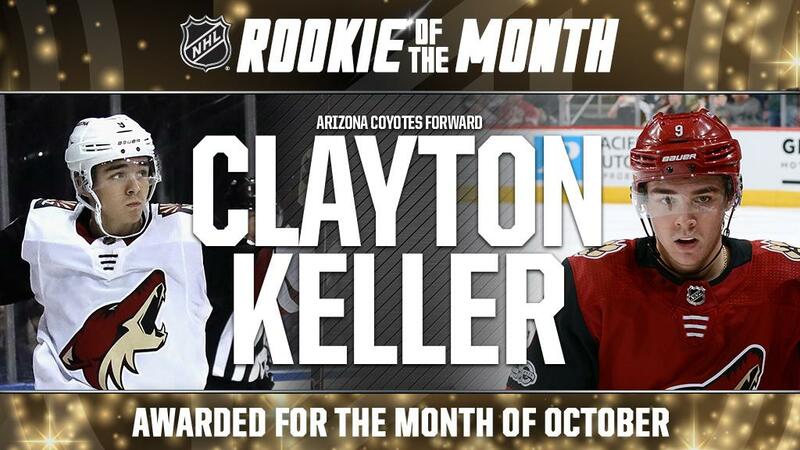 In addition, he set an impressive goal-scoring mark for recent rookies. In the first NHL meeting of Keller and Jack Eichel, former Hobey Baker Award winner Eichel had the only point, assisting on a Sabres goal, as Buffalo edged Arizona, 5-4. Alex Chiasson scored his first goal of the season in the Capitals’ 4-3 win against the Islanders. 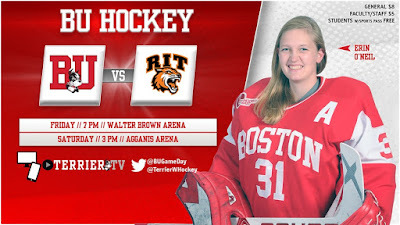 After a strong effort against BC and a tie against New Hampshire, BU begins a two game home series against RIT at Walter Brown Arena. 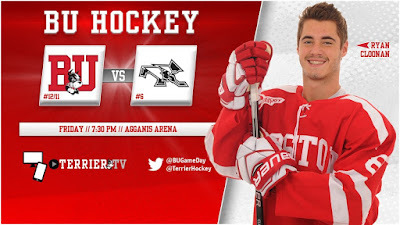 Puck drop tonight is at 7 p.m. and Saturday’s contest begins at 3 p.m. 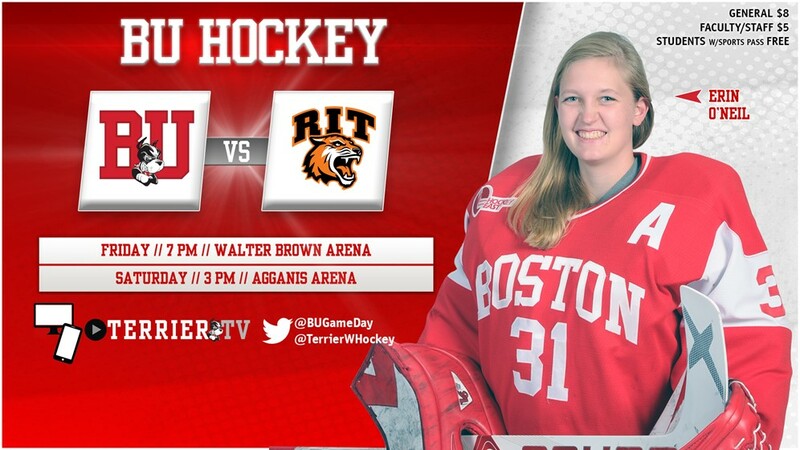 The games mark the first-ever meetings between the Terriers and Tigers. RIT has a 3-4-1 record after splitting a series with Lindenwood last weekend. Seniors Victoria Bach and Captain Rebecca Leslie lead the Terriers with 10 and 8 points respectively. Freshman goalie Corinne Schroeder, who stopped 42 shots in the tie with UNH, has a 1.92 GAA and a .944 save percentage in two starts.